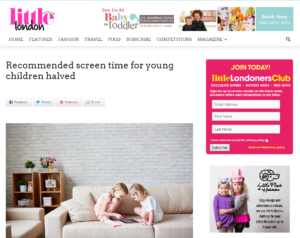 Child and adolescent psychiatrist Dr Hayley van Zwanenberg, clinical director of the Priory’s Wellbeing Clinics and medical director of the Priory’s Woodbourne Hospital in Birmingham, is supporting new guidelines recommended by US experts to limit screen time for children under five to an hour a day. Top doctors in the United States said that children under five should spend no more than an hour a day in front of television or computer screens – and infants under two should not view them at all. 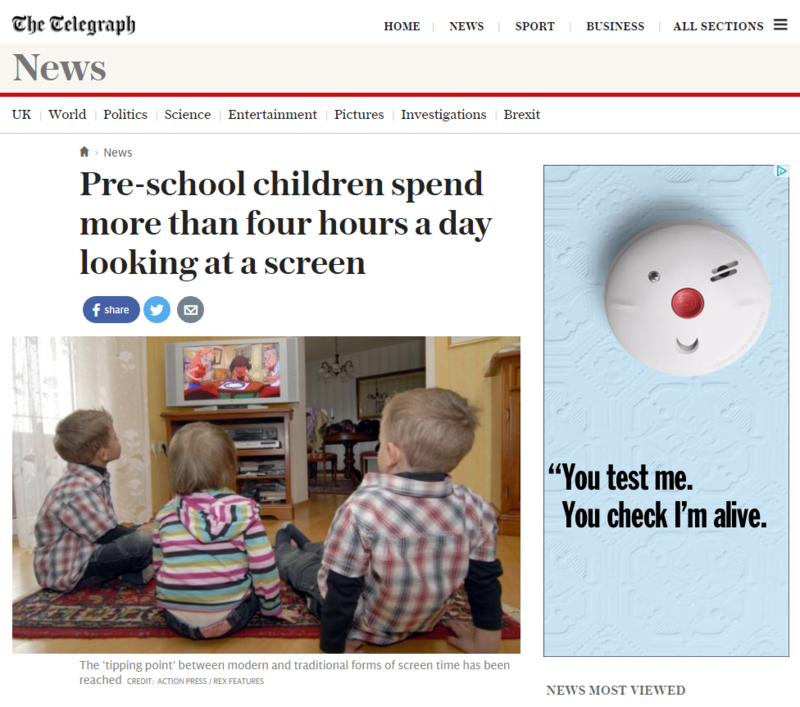 In a stark message about the growing risks of digital technology, the US doctors have halved their previous recommended limit of two hours a day of screen time for children aged over two after reviewing new evidence. The paediatricians said children’s health and development were increasingly being put at risk by the proliferation of screens in people’s homes. The new alert was sounded by the professional organisation for paediatricians in the US, but has now been reinforced by a Priory expert in Britain – where official bodies have issued warnings but not specific time limits. Dr van Zwanenberg said; “The ubiquitous use of smart phones amongst adults is now also the case among pre-school children, with parents also using TVs and laptops and iPads as ‘digital nannies’ to allow themselves time to check their own devices or complete activities. “There is ample evidence to demonstrate the negative effects of screen time on older children, particularly on those using screens for more than three hours a day; these include structural and functional brain imaging changes, increases in emotional distress and higher rates of anxiety and depressive symptoms, as well as lack of sleep. The pre-school years are particularly vital for developing non-verbal skills that young people miss completely when on screens. Although research is limited currently in the pre-school age group, I would advise parents to take even greater precautions in this age group than in school age children, as the finding in older children are likely to be similar for younger children and will probably be magnified. The respected American Academy of Paediatrics said research showed that too much use of iPhones, iPads, laptops and television was damaging children’s sleep, fitness levels and ability to socialise with others. If children were to use social media, parents should join in and ensure their offspring were watching high quality educational programmes, but ban screens at meals. The US experts also urged parents to cut down on their use of iPhones and iPads so their children did not copy their behaviour, which could otherwise increase conflict between parents and their offspring. The Academy said that very young children needed human interaction to learn, although slightly older ones could benefit from the occasional educational programme. It added that children who watched excessive amounts of television were more likely to become obese, partly because they were influenced by food advertising and partly because they over-eat while slumped in front of the set because they are less aware of when they are full. It also cited recent studies showing that children exposed to the blue light emitted by screens in the evening slept less well than others. The Academy said: “Multiple developmental and health concerns continue to exist for young children using all forms of digital media to excess. “Evidence is sufficient to recommend time limitations on digital media use for children two to five years to no more than one hour per day to allow children ample time to engage in other activities important to their health and development and to establish media viewing habits associated with lower risk of obesity later in life. 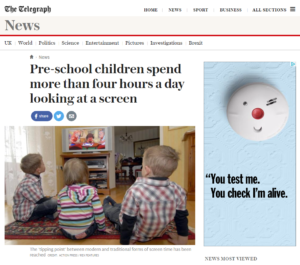 Dr van Zwanenberg said that although there was still insufficient evidence to judge the long-term effects of screens on infants and young children, guidelines were useful for parents trying to set limits on technology use. Her comments have gained a lot of media attention already with coverage in The Telegraph, The Express and Little London.